This video would augment any unit on climate and weather, the water cycle, and the ecology of wildfires. It can be used to set the stage for further exploration. For example, students could explore and identify how changes in climate conditions can affect the health and function of ecosystems, and their vulnerability to wildfires. 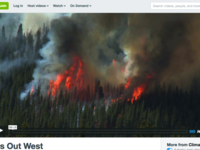 Video discusses the increase of wildfires in the American West since 2006. The relationships among rainfall, drought, vegetation type, and the severity and location of wildfires are reviewed. The role of satellites in identifying wildfire location and vegetation profile is also discussed. Comment from expert scientist: Note that green vegetation only shows potential for photosynthesis. The Nevada vegetation burns not when it is wet and green but in the summer after the rain when the landscape dries. The two ecosystems don't burn as a result of different processes but as a result of dry and hot conditions. The fact that the forest always has a high fuel load due to dense vegetation and the desert burns best during a wet year when vegetation grows does not mean that these are different. Excellent HD quality. Can be downloaded and viewed in different files - including mobile phones and original movie file. HS-LS2.C1:A complex set of interactions within an ecosystem can keep its numbers and types of organisms relatively constant over long periods of time under stable conditions. If a modest biological or physical disturbance to an ecosystem occurs, it may return to its more or less original status (i.e., the ecosystem is resilient), as opposed to becoming a very different ecosystem. Extreme fluctuations in conditions or the size of any population, however, can challenge the functioning of ecosystems in terms of resources and habitat availability.